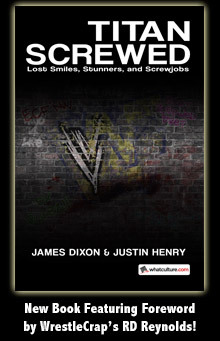 Someone Bought This: WrestleMania 29 cow - WrestleCrap - The Very Worst of Pro Wrestling! 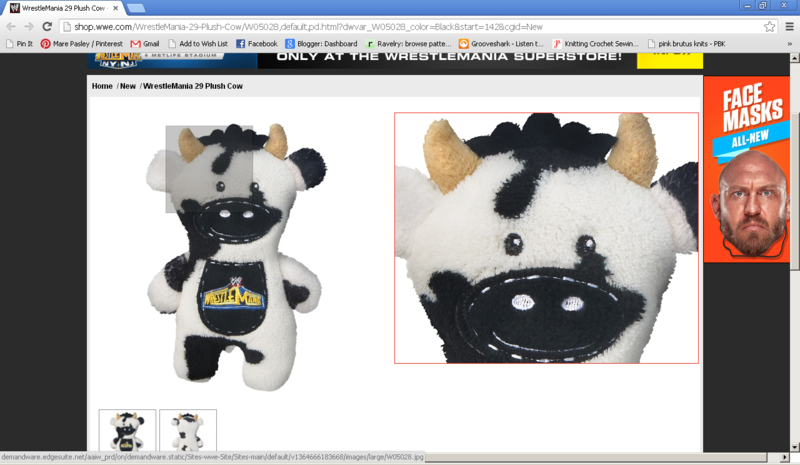 Crapper Zane Pasley sent in this WrestleMania 29 cow that you can buy at the WWE Shop. 10 Responses to "Someone Bought This: WrestleMania 29 cow"
If this doesn’t scream “running out of ideas”, then perhaps the WWE Superstar Gnomes will. Now if Ryback was repackaged as a farmer and tossed these out to the audience, it could get him over even more. Shhhh! Vince might read that and try it… Farmer Ryback? Hmm… It would actually be a deeper character then the one he has now, at least. How about a tag team of Ryback and Lesnar as a couple of farmboys? Lesnar was raised on a farm and he owns one now. Ryback used to be the Cornfed Meathead handing out knuckle sandwiches…Yeah he has always had a degree of goofiness to himself. “Cornfed Meathead??! !” God god almighty!! It would be cool if instead of pointing at the WrestleMania banner hanging on Raws and Smackdowns they pointed to the WrestleMania cow instead.